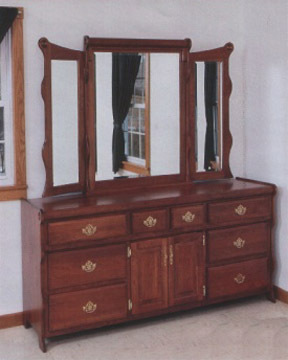 The 75” Amish made sleigh style dresser, shown here in solid cherry, is the largest of the dressers in our sleigh-style bedroom collection. With eight drawers, and two doors concealing an adjustable shelf, there is plenty of storage room for everything, and plenty of room on top for displaying items, or working on your appearance. Shown with the optional tri-view mirror, with hinged side panels, it becomes part of your complete sleigh style bedroom, especially as the doors match perfectly with our raised panel sleigh bed. Add the raised panel sleigh bed, a couple of night stands and a chest of drawers for additional storage. Then sit back as you and your friends admire the beautiful bedroom that you’ve created, and then head out to entertain them in the living room, where the matching sleigh style entertainment center is located!